As a part of our services, Computrols offers 24/7 phone support to all of our customers. If you have ever taken advantage of this offering, you have likely spoken to our Technical Support Manager, George Hingle. George has been employed by Computrols for over 15 years and is one of our most knowledgeable team members when it comes to troubleshooting in CBAS. As a means of building on our already robust FAQ page, George has agreed to share some common issues he sees in our newsletter each month. The purpose of anti-passback is to prevent a cardholder from passing back his or her card to a second person in order to gain entry into an access-controlled area. We have found that this is most common in garage areas. The anti-passback features of the CBAS Access Control System can be used to maximize security, prevent fraudulent use of cards and maintain an accurate record of the number of people who are currently in any one area (possibly for safety reasons). In an Anti-passback Area, there must be an ‘In Reader’ and an ‘Out Reader’. A Card that has gained access through an ‘In Reader’, must go out through an ‘Out Reader’ before being allowed to re-enter. Anti-passback Areas cannot span multiple Brain Controllers (Access 8X). In previous CBAS versions, there was a hardcoded size limit of 2GB for a history file. Once this limit had been reached, CBAS would stop recording all histories. In an effort to avoid loss of history collection, CBAS was outfitted with several tools to help warn of impending data loss as well as to manage and archive histories. Starting with CBAS 15, this has changed. CBAS now starts a new History file when necessary and all previous files are still accessible. So it is no longer necessary to purge past history. Did you know that the primary replacement controller for the legacy Computrols VAV controllers (VAV-X, VAV-AP, VAV-P) is the UNI-B? 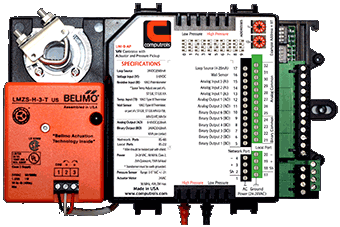 (UNI-B-X, UNI-B-AP, UNI-B-P) The UNI-B series controller downloads its programming from CBAS when an RS 485 connection is made, just like the original VAV- series . It’s easy to convert any existing programming in CBAS: In Editor Mode, Hardware View, find the VAV controller to convert. Click the VAV then click Program. On the Program screen under Model, click VAV then choose UNI-B from the drop-down list. If you have a new installation of a UNI-B, you can still use an original VAV Template, then convert it to a UNI-B. To make a UNI-B series Template, open the Template Database (in the /CBAS15 folder) in Editor Mode and find the VAV that suits your application. Then click the controller and click Save Database as a Template. The VAV can also be replaced by the application-specific VAV-B series controller (VAV-B-X, VAV-B-AP, VAV-B-P), but the VAV-B will need its communication protocol changed from the default OPTO to Computrols BASNet protocol on the Initial Setup screen of the VAV-B Utility program. In CBAS, the VAV must be deleted and a new VAV-B will be added using a template to add the points. Templates are available in the VAV-B Package (in CBAS15 folder), Templates folder. These Templates will contain more points than are needed, so you will probably want to remove some of them. The points and programming do not download to the VAV-B because all programming is already contained in the memory of the controller. Use the VAV-B Utility program to set the application for the VAV box or FCU. If you have any questions for George or any of our experts, please send them techsupport@computrols.com, and you may see them answered in our next newsletter.